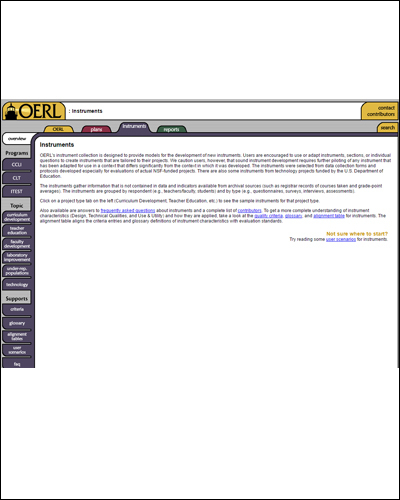 How are learning impacts evaluated in public libraries? What is currently known about the nature of STEM learning in public libraries? 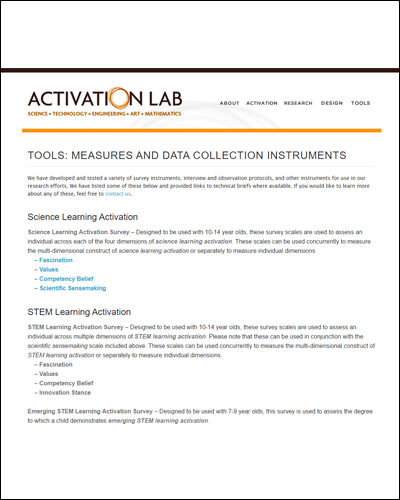 What critical factors that lead to rich and effective STEM learning experiences in libraries? Review findings from leaders in evaluating public library programs, then join the ongoing discussion! 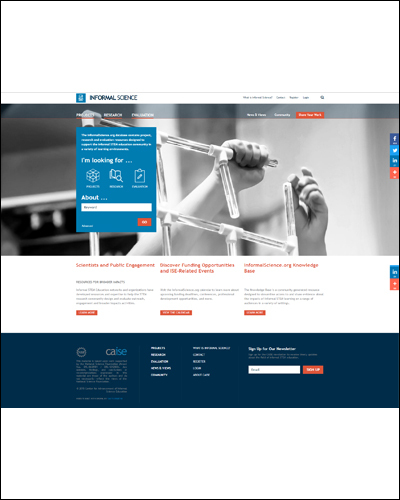 The 2015 Public Libraries & STEM conference set out to, in part, develop the foundation for a future evaluation and research agenda that examines STEM learning in public libraries. Broadening participation in science, technology, engineering, and mathematics (STEM) is a priority for educational organizations at the local, state, and national levels. Broadening participation means more than preparing future STEM professionals. It also means preparing people to draw upon STEM knowledge and practices for civic engagement and to address the needs of their communities. 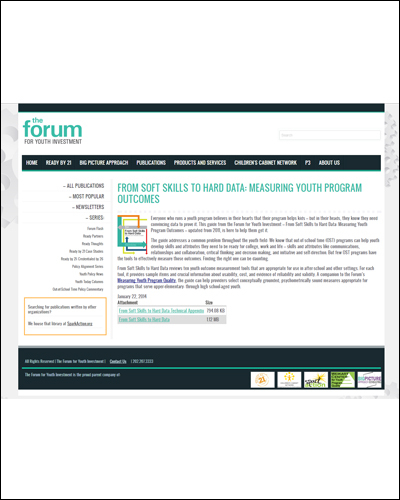 Evaluation of such programs must attend to the broad range of goals for STEM participation, document equity of opportunity to participate in STEM-related activities across settings, and support program improvement. In this presentation, I will begin by providing a framework for evaluating a diversity of outcomes of STEM programs in public institutions and for documenting equity in student opportunities to learn. I will illustrate how we are applying this framework to the study of STEM learning in different out of school settings that are focused on promoting interest-related learning. In the concluding part of my presentation, I will describe how evaluation can support continuous improvement of STEM programs in libraries, helping institutions to provide more equitable opportunities for STEM learning that lead to valued outcomes for participants and communities. We report on a follow-up study of library staff who had attended in-person and/or online professional training to facilitate hands-on Earth and space science learning experiences through the Lunar and Planetary Institute’s Explore program. End of workshop evaluations consistently demonstrate that participants leave with increased content knowledge and intent to use what was modeled at the workshop. Our survey was completed by 183 individuals who had completed training from 1998–2013. The survey asked respondents to share information about their institution and responsibilities, their use of materials or reasons they did not use the materials, and to share barriers to program implementations, partnerships they had created and successes they had in program implementation. Findings show that participation in the Explore program resulted in changes in participants’ beliefs and behaviors around leading science programming at their institutions. Sixty percent of the respondents reported that they were very committed to providing science and engineering experiences for their visitors, compared to 16% before the training, and over 75% reported that they were more likely to advocate for including science and engineering in the programs offered at their facilities. 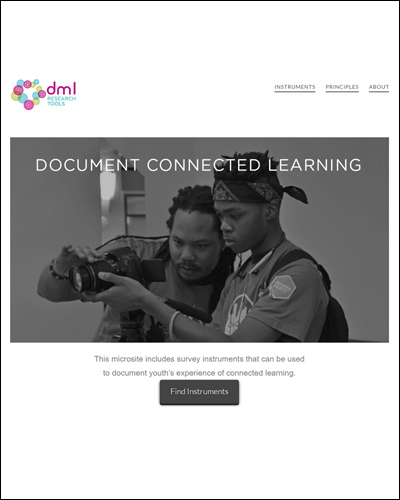 Respondents reported gains in the skills, knowledge, confidence, and a virtual network of support to bring STEM programming to their communities and reported ways in which they integrated it into their existing programs. 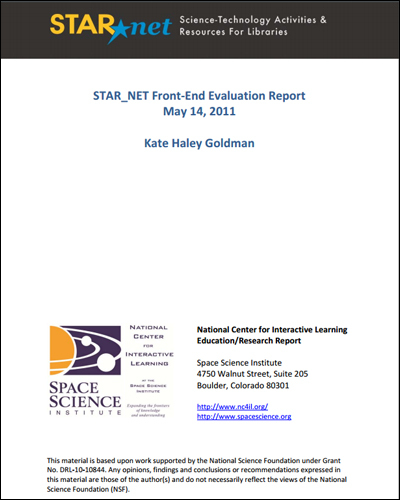 We will highlight evaluation findings from the first phase of STAR_Net (the Science, Technology, Activities and Resources Library Education Network). 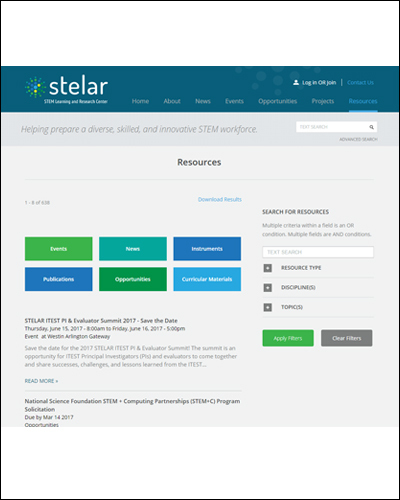 STAR_Net, was developed by the National Center for Interactive Learning and its partners with funding from the National Science Foundation. STAR_Net brought inquiry-based STEM learning experiences to 18 public libraries through two traveling exhibits, associated programming for library patrons, and a virtual community of practice for library staff and others interested in bringing STEM programming to libraries. Evaluation and Research Associates (now part of Education Development Center) evaluated the implementation of the project and its impact on library staff and patrons. The evaluation found that the project had a positive impact on participating librarians, library staff, and library patrons. Librarians and library staff reported that the project increased their knowledge, interest, and confidence in offering STEM programming in their libraries. The exhibits appeared to spark the interest of many patrons to learn more about science and engineering. Many libraries reached out and developed connections with organizations and individuals they had not worked with previously. The majority of libraries that hosted the exhibit reported that they planned to continue to offer STEM programming. Data suggests that the project may have a lasting impact on some libraries’ interest in and capacity to educate their patrons about science. 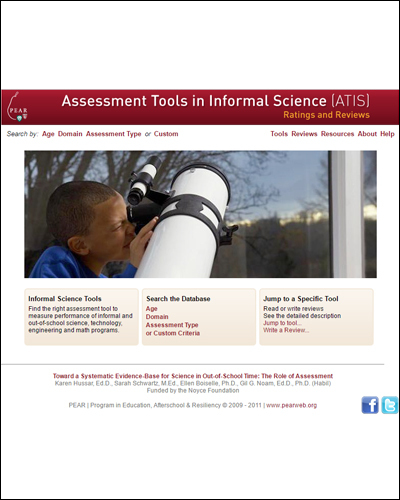 Library staff members face an increasing call to demonstrate the impact of STEM services in public libraries, yet few librarians are familiar with the designs, methods, and measure that can be used to evaluate informal science education (ISE) projects. This poster first introduces a resource to assist librarians in developing our understanding of ISE evaluation and then shares preliminary findings of a study on the outcomes that ISE evaluators currently examine and the methods they use to study those outcomes. 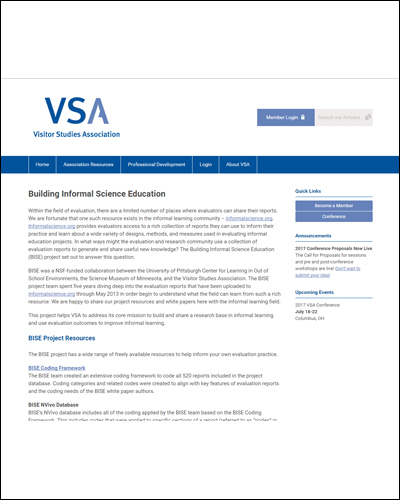 The resource to be shared comes from the Building Informal Science Education (BISE) project that was funded by the National Science Foundation in 2010. 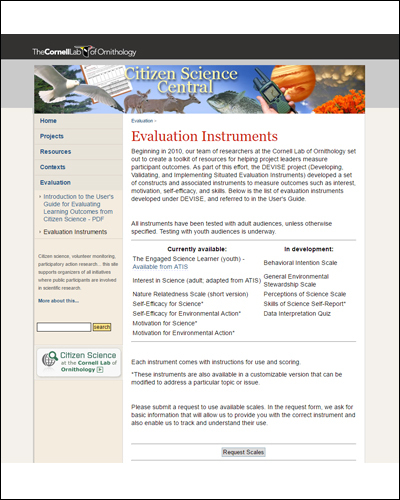 The BISE project created a database of ISE evaluation reports and developed metadata codes to facilitate searching and analysis of those reports. 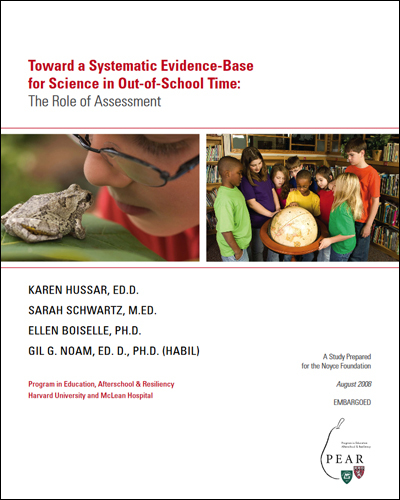 Librarians can use the BISE database and coding scheme to learn how evaluation is conducted in ISE contexts beyond libraries including museums, after-school programs, and broadcast media. This poster then reports preliminary findings of a study currently underway using the evaluation reports in the BISE database. 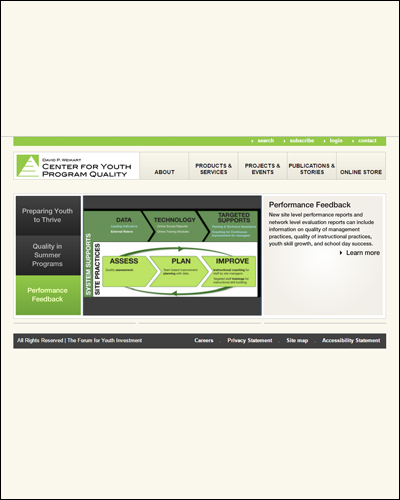 This investigation examines the reports to understand (a) the types of outcomes that evaluators of ISE projects study and (b) the designs, methods and measures that are used to examine those outcomes. Librarians can use these findings to inform our thinking as we develop approaches for evaluating the impact of STEM learning in public libraries.